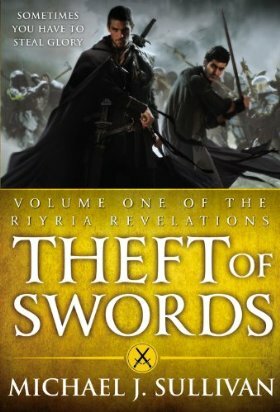 Theft of Swords contains the first two books in the Riyria Revelations by Michael J. Sullivan, The Crown Conspiracy and Avempartha. These books were self-published, but the series was recently picked up by Orbit Books, who are publishing the books in three volumes each released about a month apart. Theft of Swords is scheduled for publication on November 23. Rise of Empire, containing Nyphron Rising and The Emerald Storm, will be released in December. The final two books, Wintertide and the never-before-released Percepliquis, will be on sale in January 2012 as Heir of Novron. The Crown Conspiracy introduces the thief Royce and the warrior Hadrian, the men comprising a famous duo of thieves known as Riyria. The two are masters of thievery and manage to consistently perform difficult jobs, some even considered to be outright impossible. This reputation gives them the opportunity to earn a lot of money when a desperate man asks for their help with stealing a sword. He has been challenged to a duel by Count Pickering, a renowned swordsman who has only lost once. Since the only time the count lost was when he did not have his usual sword, this man believes his only chance of surviving the duel is making sure the sword isn’t available for the fight. Hadrian feels sorry for the man and rather likes the idea of taking a job that will help somebody out instead of the usual jobs that involve petty bickering between nobles. However, Royce requires some convincing because the job needs to be done in a short enough timeframe that he won’t be able to spend some time doing background checks and verifying the man’s story. Hadrian convinces Royce to take the job with him and the two find the sword exactly where the man said it would be along with a dead body on the floor. To make matters worse, they notice a crown that fell off the head attached to the dead body, realize it is the king, and decide it’s best to leave immediately. Before the two can leave in all haste, they are discovered, accused of murder, thrown into prison, and sentenced to death by the prince. Fortunately for them, the princess Arista knows they are innocent and devises a scheme to get them out of there along with her brother, whom she suspects will be killed next, in return for embarking on a mysterious quest for her – a quest that will unravel a conspiracy and just may save the kingdom. Avempartha takes place two years after the events of The Crown Conspiracy. It’s a new adventure that also starts when Hadrian and Royce are hired to steal a sword, this time to kill a beast that is destroying a village. While it is a new story, it also builds on the previous book and further exposes the depths of the forces conspiring to change the kingdom. Theft of Swords is a very traditional fantasy story with elves, dwarves, thieves, warriors, wizards, royalty, and nobles. At least in these first two books, it’s not a series that tries to be realistic or plausible or tones down its characters by limiting their abilities. These are characters who are among the best at what they do, perhaps even are the best there is, making the outcome of some events rather predictable. It’s also easy to figure out much of what is coming since some of the hints are not at all subtle (for instance, there was a revelation in the second book that I knew was coming ever since chapter 2 of the first book). Writing a more conventional story that utilizes common fantasy tropes like this can be a difficult thing to do since it requires creating a plot and characters engaging enough that readers don’t get bored and dwell on how they’ve read similar books before. While I do have some reservations about these books, I also think they completely succeed as one of these more conventional stories that still manages to be very entertaining. Focusing on two thieves as the main characters keeps it very fun, and Royce and Hadrian have a great rapport with each other. They work well together, but they also have a contrast in their personalities and balance each other nicely. Royce is more pragmatic and not much of a people person, but Hadrian is more idealistic and empathetic (and my favorite character in the books). While Royce tends to be into jobs for the money, Hadrian aspires to the warrior ideal of the fair fight and doesn’t really like the fact that he is a thief. They are somewhat stereotypical fantasy characters, but they are also such a great duo to read about with their mischievous ways and snappy banter. As the books continue, more is being revealed about their pasts as well and I am finding myself really interested in learning more about them, even when I suspect I know a lot of what’s coming next. In general, more was revealed about the world, the different political groups, and the mythology/history of the realm in the second book with the definite feeling that much more will come in the following volumes. I love this technique in a series – not knowing everything right up front and having bits and pieces gradually come together more in each book. There are also times where the descriptions were far too detailed for the information being conveyed. For example, there was a section describing the simple room someone lived in but it described it in much more detail than necessary to get the point across. In Avempartha, the awkward sentences and amount of detail had improved and I wasn’t stopping to take notice of these as often although something still seemed a little off and stilted sometimes. The main issue I had with the writing in Avempartha was unnatural exposition in the dialogue. Some information is necessary for readers, but the amount of details given in these sections also made me stop to think about how the characters wouldn’t be talking to each other this way about subjects they’d already both be familiar with. While the writing was a weakness, Theft of Swords works very well as an escapist story. It’s not unconventional or particularly unique as a fantasy, although it is starting to reveal a bigger story in the second book. Yet it is entertaining and it manages to keep the plot and characters engaging enough to make the fantasy tropes fun and nostalgic instead of irritating and stale. When I reached the last page, I found myself really eager to find out what happens to Hadrian and Royce next.